Low Moment High Resolution Magnetic tips MFM_LM possess 15nm* CoCr coating, which is two times thinner compare to standard MFM tips. Decreasing the magnetic moment of MFM tip is important in case of imaging low coercitive magnetic samples, such as iron garnet films with coercitivity of about 20 Oe. Using standart MFM tips with 40nm CoCr coating leads to perturbation of the magnetic domain pattern and tip induced local magnetization reversal of the sample (Fig. 1). Low moment MFM tips with reduced magnetic stray fields significantly reduce magnetization reversal during imaging and improve quality of the MFM results (Fig. 2). Standard chip size: 1.6x3.4x0.3 mm compatible with the most of commercial AFM devices. 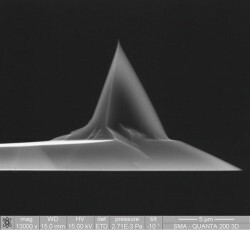 The base silicon is highly doped to avoid electrostatic charges. High reflective Al back side coating. Total coating thickness – 15-20 nm*. Typical curvature radius of the tip is about 25-30 nm. Guaranteed cantilever lifetime is 1 year if it’s storaged at the normal conditions (humidity 30-40%). *At customer request we can make probes with different coating thickness to achieve different magnetic moments which will be the best for measuring of your samples.